Since late last year we have been watching and listening. Let’s Get Wellington Moving had been a rather interesting process, with a few things to dread and some beams of hope. In case you’ve forgotten (it’s been a long time), we summed it all up here when we urged people to put in their two cents back in November 2017. And now: the crack team of experts at Let’s Get Wellington Moving have recommended a package to invest! Just tonight, Damian George reports on Stuff: the Package has Been Received. There’s yet nothing on Let’s Get Wellington Moving’s website, so we only have this report to go on. What’s in the recommended package? At first blush it sounds an awful lot like the original LGWM “Scenario D”: do some good basic walking and cycling improvements but comprehensively increase road capacity and spend lots trying to mitigate the effects on liveability, while leaving mass transit for some kind of never-never. Perhaps it’s just a feature of the reporting? We hope so… but this is precisely the kind of vagueness about mass transit, while being very specific and detailed about the more-capacity-for-cars, that worried Ministers, as Stuff reported, when the LGWM scenarios were first released. But the lack of detail around a provision for “mass transit” public transport – included in three of the four scenarios – and a notable lack of commitment to light rail has left some concerned, including new Transport Minister Phil Twyford. Associate Transport Minister Julie Anne Genter calls the provision for mass transit a “tag-on” to roading projects, while Wellington City councillor Iona Pannett and Greater Wellington regional councillor Sue Kedgley are among those who have concerned with its vagueness. Remember? Even the best predictions from the scenarios had a meagre 3-14% increase in public transport use and a 3-4% decrease in private vehicles in the city centre – that’s all Scenario D would deliver us, with its $2.3 billion price tag. Yet we know already that Kiwis do induced demand really well (just building bigger roads to fix congestion is a great way to waste hundreds of millions – just ask Tauranga). 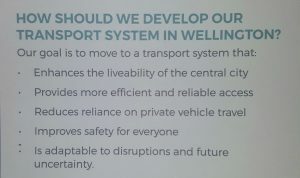 So it’s pretty concerning that this proposal – worryingly similar to LGWM’s Scenario D – sounds like it’s still being relatively specific about how it would build Wellington roads bigger, which will induce more demand, and vagueing out badly on good mass transit. Yes, the very thing that would most enable people to leave the car at home sometimes. Okay let’s be upfront here… in Talk Wellington’s opinion this would be a pathetic result for $2.3 billion. Tonight’s Stuff report juxtaposes material on the proposal with a reminder of the results of a more recent additional Let’s Get Wellington Moving survey, research conducted quietly to augment the wider public engagement. Meanwhile, results of a Let’s Get Wellington Moving survey released on Thursday revealed 63 per cent of 1334 Wellington residents supported light rail from the railway station to the airport via Newtown. Thirteen per cent opposed it. There was also support for a rapid bus system on major routes to and from the central city (62 per cent), an extra Mt Victoria tunnel with vehicle, cycling and walking lanes (62 per cent), and dedicated public transport lanes on the Golden Mile (57 per cent). This is extra significant because of what people are likely to do when asked about change and the future: people tend to be anchored in what they know. And for a few decades now, Wellington’s had a real paucity of proper public transport, with proper meaning “it’s a meaningful and competitive choice for most people’s daily trips”. Driving has been the best option, even for short trips like Hataitai to Kelburn, or Karori to Newtown. Yet even despite not knowing what it’s like to have good public transport, Wellingtonians are showing again this strong support for better and more of it. …so why are we not doing that first? Yet “reducing reliance on private vehicles” and “increasing public transport use” simply doesn’t seem to be what LGWM have tried to achieve – they seem to be trying to make our city buy bigger pants (which is the transport equivalent of making the buffet “bottomless for $15”) before helping it eat less and exercise more. Doing this is even madder when you realise that LGWM itself is predicting population growth in Newtown such that mass transit will be viable even within the oddly short time horizon they’ve set for the project. It seems awfully sensible to build first the stuff that will give Wellington people real options – the public transport, the walking and cycling, the travel demand management investment – and then see what happens with private vehicle use. It’s quite possible that we won’t need to expensively expand the road capacity. 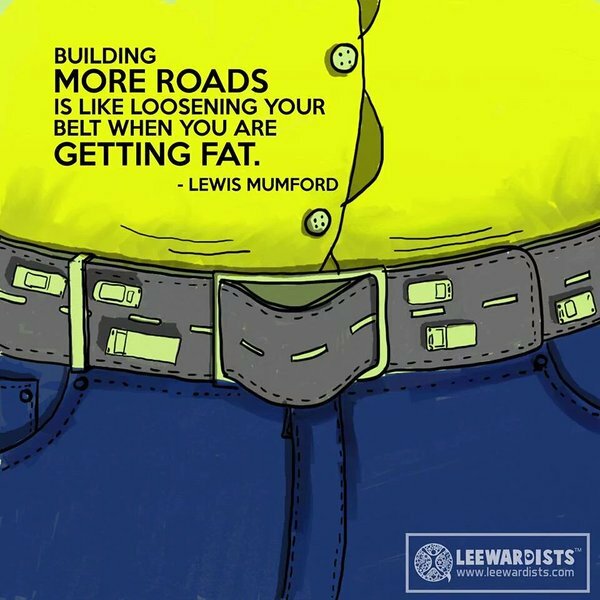 If they’re absolutely dead set on us buying new pants, at least let’s box clever about the sequencing: defer new bigger road pants for a while, let us have a go at mass transit – see what happens! This is the kind of strategic leadership we elect our leaders to provide, but if the tealeaves we’re reading in the Stuff article are true, it seems we can’t look to our local leadership for that. However, maybe someone can force this on Wellington: some Aucklander politicians, Phil Twyford and Julie Anne Genter (Minister and Associate Minister of Transport). They have some power here, despite this being mostly a local issue, because the hefty price tag of this proposal means the Wellington councils must ask Cabinet for tax money to top up what rates can’t pay for. While all of these projects have been recommended, the sequencing of their construction was still to be determined. It was also possible some of the projects could be reviewed as the success of others played out. The proposal was expected to take several weeks to be assessed by Cabinet, and a public announcement was expected in August. Hopefully Cabinet will demand some pretty compelling modelling results from LGWM governance to show that these proposals will in fact deliver to the project’s own objectives first, and to the government’s goals for a modern transport system. Here at Talk Wellington we’re taking bets on what they’ll say in August, with that slightly sick feeling knowing that the fate of our city is hanging in the balance.